There are many memories of the TLS International Labyrinth Symposium in Glastonbury, England. We have to thank Carlos Soreto, Lilan Laishley and Bo Stjernström for sending in these pictures. We hope to have the group photo shortly. For many, the event began with a walk on the Tor, that magical hill that dominates the Somerset Levels. Down lower on the hill, the path of the Tor Labyrinth is wide enough to drive an automobile on. 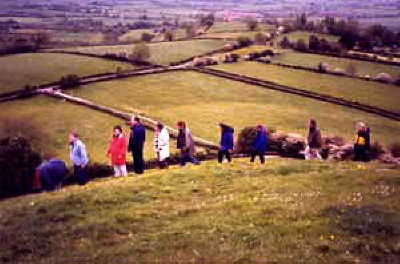 Here, closer to the goal, the group rounds the northeast end of the Tor to find that the slope is steep, and the trail has almost disappeared! Ankle crunch time!